Celebrate the five-year anniversary of the Carolina Country Music Festival (CCMF) in sunny Myrtle Beach! This year’s event will be held June 6-9, 2019 at Burroughs and Chapin Pavilion Place, right next to the Myrtle Beach Boardwalk. The event kicks off with a special kick-off concert on Thursday, June 6 followed by three full days of concerts featuring some of the top artists in country music. Food and beverage vendors will sell tasty treats throughout the weekend and specialty stores set up shop offering souvenir shirts, games and so much more. Don’t miss your chance to attend the 2019 Carolina Country Music Fest! Wondering who’s performing at the Carolina Country Music Fest this year? We’ve laid out the current lineup and schedule for 2019 right here! Headliners are in bold! Tickets for this year’s CCMF are on sale now! Tickets range from three- and four-day general admission to Super VIP with access air-conditioned tents plus complementary food and drink. Tickets sell out quickly so secure yours today! Parking passes are available for purchase with one or four-day options. Parking will be available for pass holders in the former Myrtle Beach Mall parking lot where shuttles will operate continuously throughout the weekend. South Bay Inn and Suites is one of Myrtle Beach’s newest resorts. It offers visitors amazing amenities and beautifully decorated accommodations in an oceanfront setting. Book a room or suite for a private retreat for two or pack up your family and reserve a two-bedroom condo with amazing ocean views. The list of amenities at South Bay Inn and Suites is sure to impress even the pickiest guests. Highlights include an indoor water park, game room, seasonal tiki bar and free breakfast. The resort is just a short walk to the site of the Carolina Country Music Festival. 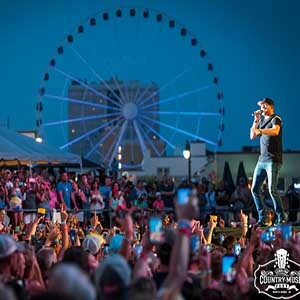 For easy access to the Country Music Fest in Myrtle Beach, check out Bay View on the Boardwalk! The large resort is just a quick walk up the Boardwalk to the festival and offers a wide array of oceanfront condos and rooms. Cool off in one of the indoor water features, including a bubbling hot tub and winding lazy river, or relax in a lounge chair on the oceanfront tanning lawn. The on-site Starbucks serves up the perfect pick-me-up drinks and snacks before you hit the town for the concerts.